Peruvian fish-eating rat Neusticomys peruviensis, photographed by Carlos Boada. 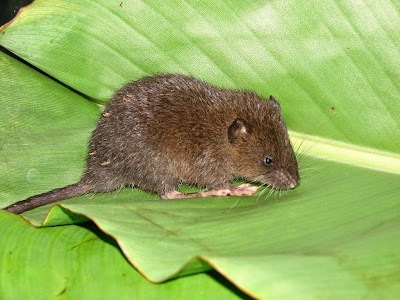 The Ichthyomyini are a group of semi-aquatic rats found in Central and South America that mostly feed on aquatic invertebrates, with some species also taking small fish. They have small eyes and ears, and partially webbed hind feet fringed with stiff hairs. Members of the genus Neusticomys have a narrower pes than other genera in the group, and may be less specialised for a subaquatic lifestyle (Packer & Lee 2007). [PL07] Packer, J. B., & T. E. Lee, Jr. 2007. Neusticomys monticolus. Mammalian Species 805: 1–3. [PCS05] Percequillo, A. R., A. P. Carmignotto & M. J. de J. Silva. 2005. A new species of Neusticomys (Ichthyomyini, Sigmodontinae) from central Brazilian Amazonia. Journal of Mammalogy 86 (5): 873–880.